The field of psychotherapy is filled with theories, from theories of personality to those of psychopathology, psychodynamic theories to cognitive and humanistic theories. Based on the philosophy of science, this volume introduces different models as alternatives to theories of psychotherapy. While models are common in other fields, they are essentially unknown in psychotherapeutic practice and research. This revolutionary volume introduces a new era, and a change in thinking by comparing different models with theories, and by showing their respective strengths and weaknesses, the ways in which models are superior to theories, by highlighting the preferential features of models over theories, and by showing how the paradigm-shift to models can have powerful implications for the whole field of psychotherapy. This brief volume is for everyone who can be affected by this revolutionary shift, including practitioners of almost every approach, working with almost every clientele. Students and teachers of psychotherapy, and to all those interested in psychology, psychiatry, nursing, rehabilitation, and counselling will find this book gives a new and refreshing look at approaches to psychotherapy. Alvin R. Mahrer, Ph.D., is Professor Emeritus at the School of Psychology at the University of Ottawa. A fellow of the American Psychological Association and past president of its Psychotherapy Division, Dr. Mahrer has published eleven books on experiential psychotherapy and holds dozens of lectures, and workshops each year in Africa, Asia and Europe. He's the author of 17 books and approximately 250 other publications on psychotherapy. He has been honoured by several divisions of the American Psychological Association as a Distinguished Psychologist of the Year, a Living Legend in Psychotherapy, and a recipient of the Rollo May Award for Pursuit of New Frontiers of Knowledge. His astounding 45 year career has focused on his development of Experiential Psychotherapy. 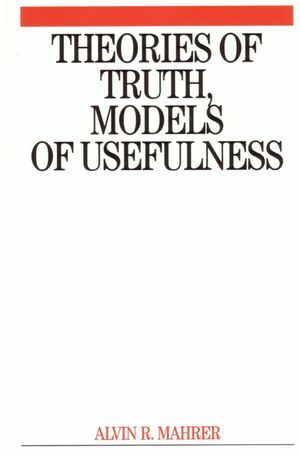 Distinguishing Differences Between Theories of Truth and Models of usefulness. Some Preferential Features of Models of Usefulness Over Theories of truth.